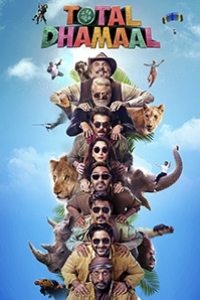 `Total Dhamaal` is the third sequel to Dhamaal, sequel to Double Dhamaal, and last/final installment in the trilogy. It stars most of the actors from the previous film, including Arshad Warsi, Sanjay Dutt, Ritesh Deshmukh, Jaaved Jaaferi and Aashish Chaudhry. The film promises to make the entertainment triple the what it was in the prequels.